I work in the animation industry as an animator, character designer and storyboarder. the story unfolds in both French and English and is illustrated with colourful cartoons. 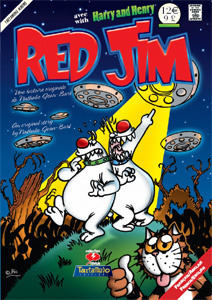 RED JIM is a children's book that is enjoyed by both children and adults. Cheerful Madness!! online shop My online shop where you can get cute, whimsical and colourful cartoon animals and characters on a wide range of products (apparel, accessories, gift items, etc), all customizable. I am the author and illustrator of a bilingual, French-English, children's book published recently. J'étais présente en tant qu'auteur au Festival des Artistes, Ecrivains Voyageurs de La Plagne, qui s'est tenu du 10 au 13 août 2008. When you join there you are encourage to post your book information for everyone.